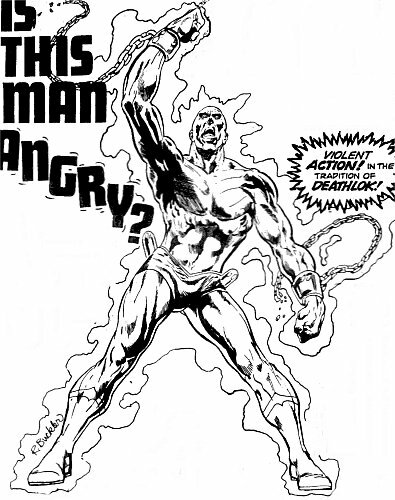 Identity/Class: Unknown - may be cyborg, given that he is described as being "brother to machine"
Powers/Abilities: Unknown - presumably good fighter, possibly superhuman strength (since he's breaking chains in the picture), and some unspecified psychic powers. History: "In a world with no future, where all mankind is enslaved, the alien masters must confront the power of one man wh has risen above all others to fight back! A man of extraordinary power, the psychic redeemer, brother to machine, harbinger of destruction...Killinger!" Comments: Created by Rich Buckler. The character is described as "More savage than Conan! More brutal than Deathlok! More exciting than anything you've seen yet in comics!" Thanks to Paul Muir for informing me of this character, and providing both information and images.